Groovetrak Network News re-published this News & Observer Blog segment. I advocate for fairness and a positive outlook for all children. This is only accomplished by transformational leadership and improved family involvement in neighborhood or assigned schools to assist high and under achievers through direct advocacy and channeling policy and information to and from members of School Improvement Teams. This news report indicates that there is significant initiative and coalition already in Wake County but…at the end-of-the-day this “national problem” of mounting infraction against the school-based disciplinary codes and the racial achievement and the system-breakdown to trust subgroup potentials will require entire community involvement like the old days… It will require definitive changes from [our] homes, schools, work prospects in he city, county and RTP and modeling positive lifestyles along with this kind of comprehensive advocacy recording data and recognizing trend. It took years of complacency on several sides for this enormous problem to develop and it will take no-nonsense-patience to collectively put our children first…to support them 24-hour a day in homes, schools and life in the real world where will we sometimes have to yell to get others to understand what assets today’s youth, parents, community advocates (as American human capital) are in our video-game and “anti-knowledge” popular culture. As our children start another school year, there is some math that I am having a hard time getting my head around, and this time it is not my daughter’s eighth grade homework, it is the statistics behind North Carolina’s, and specifically Wake County’s, school-to-prison pipeline. The shooting death of Michael Brown in Ferguson, MO, and the systemic racial inequality issues that face America today have prompted me to change the focus of my work going forward. As a community we need to continue to be aware of the inequities that members of our extended community face on a day-to-day basis. This is not just an issue on the news, it is happening in our own backyard. The report states that although a couple of task forces were set up to improve this situation, “little progress has been made over the last two years, and the reasons behind the inaction are unclear: Is it indifference, complacency after some progress had been made, changes in district leadership, competing priorities, or something else?” Could the reason the numbers have not budged be because we are not complaining loudly enough that these numbers are unacceptable? You can read the August 2013 report via this link http://www.legalaidnc.org/stateofpipeline.pdf. 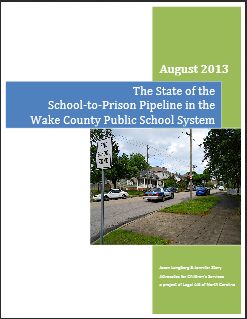 UPDATE From Journalist: I (Heidi Walker) reached out to Wake County Public Schools and asked what is being done to address the school-to-jail pipeline in our district this year and they provided me with their most recent update. They have introduced The Restorative Justice program in a small number of schools. This is promising but funding is uncertain for the long-term future. You can read the update via this link. Previous The Grio.Com: Age & Health Is A “Mental Matter” Says Sam “Sonny” Bryant Jr.!